Corwin Menivie and Nika Sanitvan are decorated veterans of the Imperial Enforcement Coalition, and they solve cases the old fashioned way. However, when they are paired up with Westley Tavera and Gavin Hale, a powerful Reader/Ground team, things start off awfully rocky. During a routine investigation, Westley stumbles across a trail left by a brutal serial killer who traps and slaughters his prey mentally. The find haunts Westley, who requests to investigate the case further, but the rest of the team isn’t exactly thrilled by this. 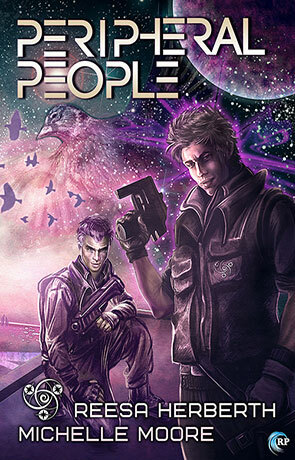 Gavin worries for his partner’s mental health, Corwin doesn’t care for Psy Agents much at all, and Nika just finds herself frustrated with everyone else on the team. When another body comes up that matches the same profile as the first, the team goes to get a read on the body. Westley falls into a psychic trap laid by the killer, and the team realizes that they are now on the killer’s radar. Peripheral People isn’t just about an investigation. It’s about four people learning to work together; it’s about them falling hard for each other; it’s about the hardships that they have endured. It’s about people more than it’s about an investigation, and it’s about humanity. This is why I fell so hard for the novel, and why I read it all in three sittings (I had to pause to work, you see). The world-building is incredible. The Ylendrian Empire in which the narrative takes place isn’t really explored, but we get just enough scraping of the surface to keep us satisfied and interested. The minimalist descriptors lets the reader draw their own conclusions, while the underlying framework is perfectly set up. Despite the great world-building, the characters are my favorite part of the novel. They are all flawed, and wonderfully so. The issues that each of them struggles with seem real and painful, their concerns for each other genuine, and their love for each other overpowering their knowledge of these flaws. When Westley and Corwin first started to fall for each other, I was a bit annoyed—it starts off as the tired trope of “girl and boy hate each other, secretly love each other” (except here it is “boy and boy hate each other, secretly love each other,” which is refreshing). However, the authors do a fantastic job with explaining why that hatred, or that pretend-hatred, was even there in the first place, and I didn’t find myself doubting their relationship once. Jane Espenson said, “If we can't write diversity into sci-fi, then what's the point? You don't create new worlds to give them all the same limits of the old ones.” Peripheral People does this. Westley and Corwin are in a gay relationship, but there is none of what we see in our world on a daily basis—shame, disappointment, bullying, anger over this decision. They are gay and so what? That wasn’t the focus of the novel, it was an aspect of it, and I loved what that added to the story. The plot of the novel was the one thing that I wasn’t completely sold on—it was good, and it was enjoyable, but it dragged a bit. Thankfully, the characters were so great that it didn’t bother me much at all, and I’d definitely recommend this one to friends. Written on 5th June 2015 by Vanessa.